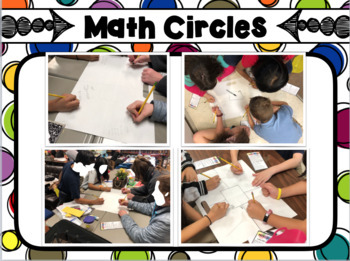 MATH CIRCLES have become a game changer in my classroom!!! 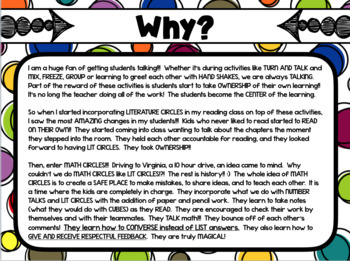 I am in love with LITERATURE CIRCLES and NUMBER TALKS, and I thought, why not have MATH CIRCLES?!? Well, they are just as MAGICAL as both of those are!! With Math Circles, you will promote and encourage STUDENT OWNERSHIP and LEADERSHIP in the classroom. This activity is completely STUDENT CENTERED! Students will have independent work time within their groups, conversations comparing their work, and reflection time. 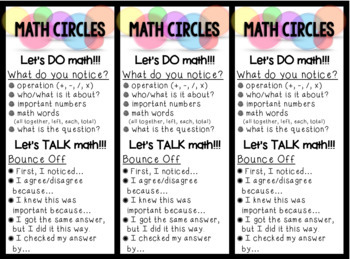 They will use the MATH CIRCLE BOOKMARKS to guide their thinking during the independent work as well as the group work. Yay!! 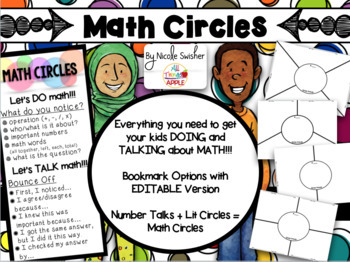 In this set, you will find everything you need to get MATH CIRCLES started in your rooms!! I have given explanations of the WHY and HOW to get everything rolling. I am so excited for you all to get MATH CIRCLES rolling!!! Once you do, I would LOVE to know how they are going and how you have made them work in your rooms!! Thank you so much for you support, and please, let me know how I can support you with this resource as well!! !